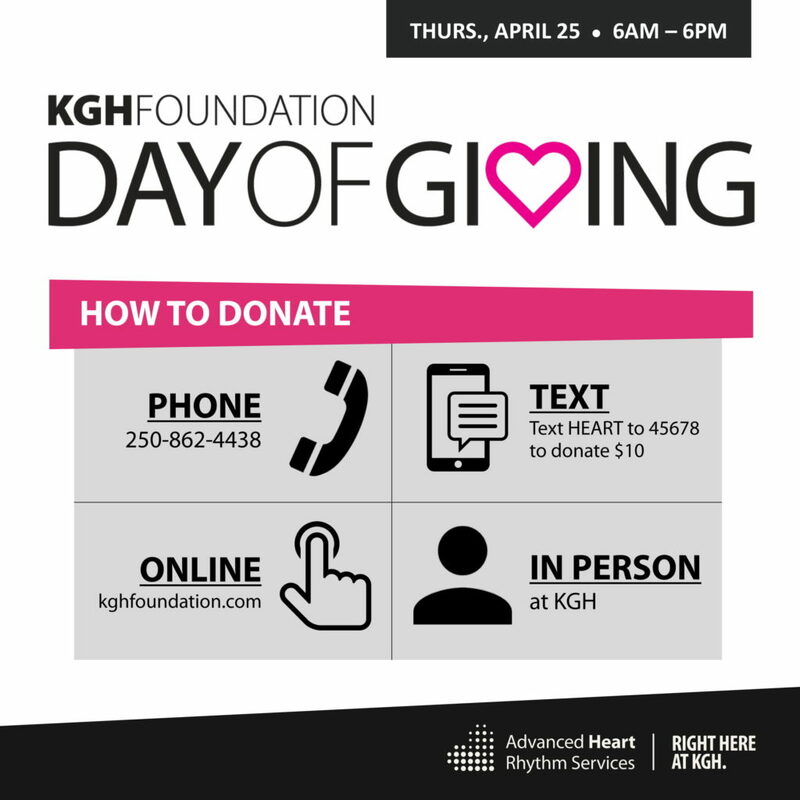 April 25 is the KGH Foundation Day of Giving, a call to the community to support excellence in healthcare, right here at KGH. Funds this year will go towards the KGH Foundation’s campaign to complete the cardiac program with the addition of Advanced Heart Rhythm Services. It’s a cause all too familiar for Darrell and Margaret Porubanec, who witnessed their youngest son Trevor, just 22 years old at the time, fall to the floor unresponsive, later to be diagnosed with a life-threatening heart rhythm condition. Thankfully, trained medical staff in Kelowna saved Trevor’s life, but he required immediate diagnostic attention to determine the cause of his cardiac arrest and treat future episodes. Unfortunately, heart rhythm services are not currently available at KGH, so Trevor had to be airlifted to Victoria. Trevor required an Implantable Cardiac Defibrillator (ICD) to be placed inside his body, so that should another episode occur, the ICD could restart his heart instantly. And soon, with the addition of an Electrophysiology Lab, patients like Trevor can receive the specialized care they require, right here at KGH. Darrell and Margaret, with the support of their sons Trevor and Murray, will be matching all donations that come in on the KGH Foundation Day of Giving, April 25. Every call, text and online or in person donation will be doubled, thanks to this incredibly generous family. The cardiac program at KGH rivals any of the best in the country. Now serving as the largest referral hospital for specialized care in the BC interior, Kelowna General is no longer just a community hospital. Of the hospital’s 400 beds, an estimated 100 are occupied by patients from out of town, many of them receiving care for cardiac conditions. Currently, all patients requiring heart rhythm treatment, like Trevor Porubanec, must wait for a bed to become available in Vancouver or Victoria, a wait which takes its toll on the patient and their family.